FANTASTIC 16th CENTURY MANOR IN TOWN CENTER, NEAR BEACHES. This is a significant part of the Manoir du Belvedere, occupying an entire floor. It has its own private walled garden, and its own entrance to rue du Chateau, a historic street connecting Auray centre and the medieval port of Saint Goustan. All rooms are large,with high ceilings, original beams and fireplaces.Tastefully furnished with Louis XV and Henry II style furniture, tapestries and paintings from around the world. There is a piano in the Chateau room. The spacious living room is full of light, with very comfy sofas, armchairs and cushions. The kitchen and bathrooms are recently renovated with modern facilities, tiled walls and floor. A separate and bright dining room is ideal for colder evenings. Outside, a large covered patio is a great place for alfresco dining while the garden is ideal for a barbecue. Quick, easy access to SANDY BEACHES (Trinite-sur-Mer, Carnac, Erdeven, Etel),sailing, surfing, cruises on the Gulf of Morbihan and ferries to Atlantic islands. The Gulf of Morbihan had a dozen pretty islands, some public and some private. Rambling, golf and horse-riding, an aquarium, an eco-park and an arboretum add to the wide choice of family activities. Our house is in the heart of this mediaeval town - many restaurants, sea-food specialities, Breton creperies, pizzerias are in walking distance. A restaurant with 1 Michelin star is a 2 minutes walk away (Restaurant Terre-Mer). A traditional covered market is 100m away, esp. good for oysters, lobsters and other shell fish. No need to use car, all necessary shopping for food, clothes and souvenirs ... is within walking distance. If you still want to use your car, parking is nearby. The Manoir du Belvedere is spacious, ideal for family gatherings, two families sharing, a big family or a small family. 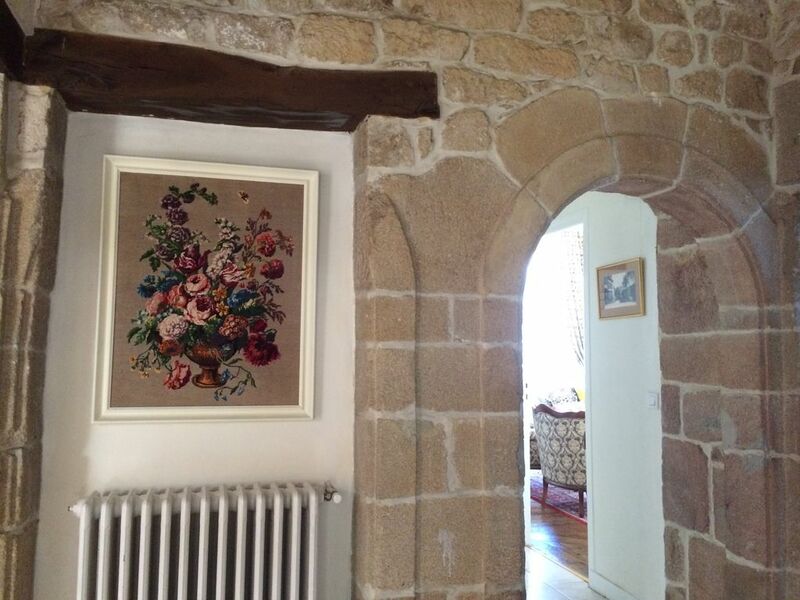 It is situated on 1st floor, with own private entrance and own big private garden - a rarity in the heart of Auray. Everything is within reach. From here you can walk to get everything you need - from fresh croissants for breakfast to the must-haves for preparing a home-made gourmet dinner. Auray's colourful Monday market will attract you and your children alike. Here you can buy fresh local produce, Breton handicrafts and souvenirs while practising your French! In the covered market, open every morning except Sunday, you will enjoy choosing from a great variety of fish, oysters, mussels and other shell-fish, not to mention a wide range of cheese, fruit and vegetables. Public swimming pool, tennis courts and library are nearby. Traditional Breton music and dancing ('fest noz') in surrounding towns and villages. You can explore many popular places of South Brittany within a 5-10 minutes' drive - Vannes, Saint-Anne d'Auray,Trinite-sur-Mer,Carnac, Quiberon, Locmariaquer, Iles-aux-Moines, Etel, Rochfort-en-Terre. Glimpses of history: Built on the site of the original 12th century Chateau d'Auray, from cut granite stone auctioned when the chateau was demolished in 1550, the Manoir stores a rich and long history in its walls. It has been renovated by France's master craftsmen. During the renovation we unearthed many traces of the past, from original fireplaces hidden behind modern facades to the chateau-style floor in the living room, equally well concealed under hardboard and which could be restored only by France’s master craftsmen. The higher wall visible from the Garden wall is believed to be part of the Chateau's keep. Visit the iconic, picturesque port of Saint Goustain, across the 12th century bridge, a few meters from the Manoir. This is where Benjamin Franklin arrived in 1776 to seek France’s support for American Independence. You will enjoy walking along the top of the ramparts that overlook the river. Hike upstream to the Champs des Martyrs, legacy of the Royal Navy's involvement in the 'Quiberon Affair' in 1795 and read the inscription (be warned: it is in Latin!). Five minutes by car brings you to world famous Saint-Anne d'Auray. Visited by Pope John Paul II in 1996 and by over half a million pilgrims and tourists every year, the basilica is situated on the spot where, in 1624, a local ploughman had a vision of Saint-Anne, the mother of the Virgin Mary. Many other must-sees only a few minutes drive away. An ideal place for whatever you want to do! We had done a great amount of renovation while keeping the historical architectural heritage intact. We did much of the renovation work ourselves, except the part that must be done by master craftsmen. During the renovation, we have uncovered many features that had been hidden for centuries. When we visited this property with the real estate agent, it was raining and dark. Yet when we came into the house, it looked great. And we though if it looked like this on a gloomy rainy day, it must be gorgeous during normal days. And it is indeed. It is always cool inside even when it roasts outside. Air conditioning is never needed. The 1m80- thick stone walls in the basement must have something to do with the cool air we always have, no matter how hot outside. And the house is full of history. Its garden is spread on 4 different levels. The house has charmed every visitor. Everyone who has been here said that we had found an ideal place for fun, history, activities, relaxation, shopping, cultural discovery and more. Bathroom cleaning products are provided. Bath towels and hand towels can be hired at 5 Euros per set (1 bath towel and 1 hand towel) per person. Please bring your own beach towels. Due to the thick stone walls and wonderful architecture, the house is always cool, no matter how high the external temperature is. It never needs air conditioning. Parking spaces always available nearby. Guests receive a parking map prior to arrival. Electric coffee maker and non-electric pressure coffee maker. Town centre. Parking nearby, a range of possibilities. There is a newly built, huge swimming pool complex, with multiple water massage points, 4 pools, sauna, and water slide, located near supermarket Super U, To minimise things you need to bring, we provide tea-towels. We also provide floor-cleaning materials and vacuum cleaner. All our furniture is made of hardwood and selected with great care. To wipe off the dirt or spills, simply use a damp cloth or wet cleaning wipes. Cleaning wipes (similar to baby wipes) can be purchased in the supermarket nearby. If you break a glass, a bowl or a plate, please replace them immediately. You can buy them easily in the home appliance shops or supermarkets. This would be simplest. We vey much appreciate your taking the trouble to review the Manoir. We are so glad you enjoyed your stay here. This is really helpful for us and other guests. The apartment in Auray is perfectly situated in the old picturesque quarter of Auray, a short walk from the lovely port of St Goustan and its lively bars and restaurants as well as the centre of Auray with its shops and market. In addition there were lovely walks available long the river. Auray is perfectly located for exploring Brittany and in the time we were there we visited Brest, St Malo (which is highly recommended) and the town of Vannes which is lovely to walk around. We travelled to Auray by car from Caen and found the apartment very easily. Whilst there are a few stairs to climb to reach the apartment once in, it is lovely. It is very light and spacious, with very large bedrooms and sitting area, and the garden was great for our dog. The whole holiday was extremely dog friendly and we were able to take our terrier into all the restaurants and shops we visited - apart from the supermarkets. Nigel was an extremely helpful host, and responded to all our enquiries promptly and informatively. Couldn't ask for a more! Thank you very much for taking the time and trouble to write this review of your stay at the Manoir. We are so glad you enjoyed your stay - and your dog did too! Having a dog ourselves we know how important this is. Our family had a very pleasant stay here. This was our first time in Auray and we loved the place. The town has tons of character and lots of good individual places to shop, drink and eat. It was a really good place to be based in order to explore this part of France. Very nice property in the heart of Auray. Spacious and comfortable. Ideal stay in Auray!. We always appreciate it when our guests take the trouble to write a review. We are so glad your family enjoyed both Auray and the Manoir itself. It's a wonderful place for families. We really enjoyed our stay. The house was very spacious and comfortable. We found the bedrooms to be very comfortable and spacious. We used the dining room and the kitchen often for enjoying our breakfast and lunch that we picked up in town. We also liked the games and pamphlets that we in the house. We made use of the walking trails along the river to get some exercise in. We really liked the all the creperies and shops in Auray and St Gustan. We ate dinner out most evenings. We enjoyed the Monday market and the daily market in town. We got some wonderful seafood, fruits and vegetables. We made some nice day trips to Quiberon and Belle l'ile and to the nearby beaches. We would certainly go again and would stay here. Our hosts were very nice and helpful before and during our stay. A very clever partion of the manor house has left a very comfortable and spacious gite of the middle floor. With ample room, and more besides for a family of 5 and a mini daschund. Beautifully decorated in a style befitting the high corniced ceilings and ornate fireplaces. The clever design extends to the elevated garden to which you can walk out directly from the gite, and gives a wonderful space to enjoy the evening sun and a barbecue. Located in a pedestrianised touristic street, the gite is close many restaurants and bars both in Auray and St Goustan port across the cobbled bridge at the foot of Rue du Chateau. The walks around the town, particularly through the woods and along Quai Martin are excellent, and the square in St Goustan into which the chairs and tables spill is a lively sun trap for an afternoon glass of the local cider and a spot of people watching. Parking is not at the property but is not inconvenient at a short few minutes walk into the town. It might be a little confusing to the initiated at first, but was clarified from the outset by Nigel, the gracious hose who lives nearby. He also provided a raft of materials for the attractions and boat rides around the Bay of Morbihan, all within short car journeys from Auray. All in all a fantastic and beautiful property in a fantastic and beautiful town. Thank you very much for your kind comments! We are very happy that you and your family so much enjoyed staying at the Manoir du Belvedere and that you find so much to see and do right on your doorstep. Could you please adjust the review I wrote a couple of days ago for this property making five star rather than a four star review. Luxurious manoir built in the 16th century on the site of the former Chateau d'Auray, constructed in the 13th century to keep out British invaders. The rented property is on the first floor of the Manoir, accessed through a private entrance through Iroko staircase. It has its own garden and everything is private for the exclusive use of the holiday makers.There is piano for making music in the Chateau room. The Manoir is on a pedestrian street. From the 'garden' bedroom you can see parts of the original fortifications as well as the 250 year-old Magnolia Floribunda and a 13th century box tree. The manoir is an ideal location for exploring Brittany's popular places: Vannes, Belle Ile, Quiberon, Carnac, Rochefort en Terre and the Gulf of Morbihan. Many easy-to-reach beaches to choose from. Several supermarkets close by, including one within walking distance, making self-catering equally effortless. There is a newly built huge swimming pool complex with 4 pools, water slide, multiple water massage points, sauna, exercise machines. It is located near Supermarket Super U. 20 restaurants within 5 minutes walking distance. Daily flights from the UK to the nearby airports of Nantes, Dinard and Rennes. Roughly two hours by car from the ferry ports of Roscoff and St. Malo. Three and a half hours by TGV from Paris. Car hire available at Auray train station. Golf: Golf Course at Ploemel, about ten kilometres from Auray, with 9 and 18 hole courses. Also at Baden, five kilometres from Auray, with 18 holes. Rates are expected to change until reservation is confirmed. Cancellation at least 30 days before check-in: 100% of the amount paid will be refunded. Cancellation between 14 and 30 days before check-in: 50% of the amount paid will be refunded. Cancellation within 14 days of arrival: amounts paid will not be refundable. Towel rental (if desired, 5 Euros/person) are to be paid on arrival. Check-in time is 16:00. Check-out time is 10:00. Pets welcome.